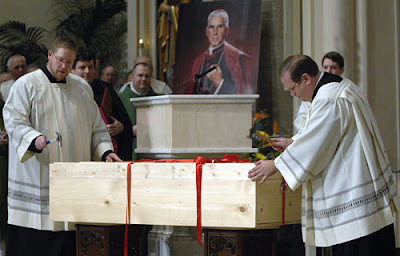 In the heartland cathedral where, as an altar boy, he once shattered the bishop's cruet, a Mass yesterday marked the close of the local investigation for the beatification of the great Fulton Sheen. Cardboard boxes filled with documents, studies of Sheen's writings and testimonials to his holiness of character were placed in a larger wooden box. That crate was then wrapped in red ribbon and sealed by Bishop Daniel Jenky in front of a packed St. Mary's Cathedral during a special Mass marking the occasion. Assistants then nailed down the lid of the crate, which will be sent today to the Vatican in Rome as part of the effort to have the Woodford County native recognized as a saint in the Roman Catholic Church. After the Mass, the faithful crowded around the crate, which one official said contained more than 6,500 pages of information. Pictures were taken, and some knelt before it in prayer. Diocesan officials had earlier signed documents certifying the materials' authenticity, ending Peoria's role in the investigation of Sheen's life, writings and at least two miracles attributed to him. Sheen was born in El Paso in 1895, attended Spalding Institute, was ordained a priest in 1919 in the cathedral where Sunday's ceremonies took place and served as assistant pastor at the old St. Patrick's Church in South Peoria from 1926-27. He then became known for his national radio show, "The Catholic Hour," which aired from 1930 to 1950 and, later, hosted the award-winning television show "Life Is Worth Living," which aired from 1952 to 1957. He died in 1979. The next phase of the investigation could take two to five years, according to the diocese. Now known as a servant of God, Sheen would next be beatified and given the title of blessed. The stage after that would be sainthood. Sheen's canonization would make him the first American-born male saint. "Archbishop Fulton Sheen is the kind of saint America needs today," said the Rev. Andrew Apostoli during the Mass' sermon. "He was a great teacher of the faith, a great defender of the faith." Apostoli, vice postulator for the Cause of Canonization of Archbishop Fulton J. Sheen, also called Sheen the "voice of the Catholic Church in America for almost 40 years." While Sheen was known for a somewhat flashy public style, the private image of the archbishop that has emerged is one of a penitential man of strong devotion to God, Soseman said. "Through talking to people who knew him, seeing things I never imagined I'd see, you start to put together a picture of his public persona but also a private persona," Soseman said. Letters attesting to Sheen's persuasive personality - he was known for helping to convert many people, both well-known and otherwise - and personal touch with ordinary people flooded in, the priest said. "Nobody knew most of these things," Soseman said.